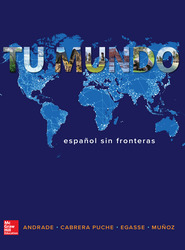 Tu mundo immerses the Introductory Spanish classroom in a culturally rich world full of opportunities to discover and explore the powerful connections between language and culture. Instructors are provided user-friendly resources to guide students as they dive into intensive communicative practice, building confidence in their ability to interact in meaningful ways in Spanish. Importantly, instructors are also provided with the tools to build a sense of community in face to face, hybrid, and online classes, resulting in a unique personal experience that evolves organically and sparks a natural curiosity about their world. 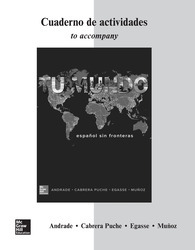 Communicative and Flexible: Tu mundo is designed to work well with a variety of communicative approaches. The goal is to provide an ideal environment where acquisition can take place, without fear of making mistakes. Consistency and Performance: Tu mundo offers a dynamic adaptive learning tool called LearnSmart that focuses students on the grammar and vocabulary they haven’t yet mastered, filling the gaps to prepare them for in-class communication. 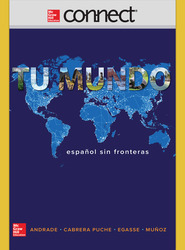 Community and Connections: Whether in a physical classroom or in an online course via Connect Spanish, students are provided with opportunities to engage in meaningful conversations and collaborative task-based activities that enable students to practice their language skills making connections and understanding the Hispanic world. Go mobile and improve outcomes: By pairing Tu mundo with the Connect platform, LearnSmart, grammar tutorials, and other digital resources, students can access their course content anywhere, anytime; improving both their homework experience and their overall performance.